It won't always be easy and being a follower of Jesus doesn't mean I am problem free. I have made so much progress over the last year, but I still struggle. The difference now is I am learning to turn to Him when I have my hard days. There was a hymn I grew up singing in church called Trust and Obey. The chorus goes, "Trust and obey for there’s no other way to be happy in Jesus, but to trust and obey.” Sounds easy enough. Yet as I look back at what has happened in my life over the last eight years, the words have such a different meaning for me now. Now I really understand what they mean. Sometimes trusting and obeying can be easy. Sometimes it's hard and painful and tiresome. We live in a society where you can have just about anything that our heart desires, but what if what our heart’s desire is not what God desires for us? What happens then? Do we still trust? Do we still obey? In May of 2008, in a span of four days, my father passed away suddenly with no warning, and my mother-in-law who was suffering from terminal cancer also passed away. Their funerals were three days apart. Everything was different; our lives had been shattered and I started to spiral out of control. My mom had died when I was 21, just two months shy of my first wedding anniversary and now this. God had taken away too much and I was mad. There was no more trust; all I felt was anger and despair. I tried to put on a brave face, but inside I was a mess. Depression, anxiety and anger -so much anger. I was on so much medication to cope with my emotions I could barely function. Did I still trust? Did I still believe in the things I had learned growing up in a Christian family and in the church? Did I still want to obey? That frame of mind caused me to be addicted to some of the medications I had been prescribed to help me deal with all that was going on in my life. I just wanted to stop hurting. I was a mess and all the medications only made things worse. I could only focus on my pain and how I felt. I had been attending Apex for a while. Even though I was mad at God, I knew deep down in my heart I needed to be there. I would come and sit in the balcony, listen to the sermons, feel convicted for a while and then fall back into living a life filled with fear and anxiety and anger. Despite not knowing what I really believed, something kept drawing me there. I even got involved in a house church and got to the point where I managed to stop taking the medications on a full time basis. I just used them as a crutch when I felt like I really needed it. Why deal with all of the pain and hurt, if you can just pop a pill and forget about it. Early last year I learned about a summer mission trip to Cancun that Apex was leading. I had spoken with Rita Haworth and soon my daughter and I were signed up to go on the trip. After we paid our deposits, I started to panic. What had I done? How would I manage my anxiety? What if I had a total meltdown in front of people I didn't know? I didn't want anyone to know what was going on in my life. I decided it was not such a good idea to go on the trip and I told this to Rita. She looked at me and smiled and said, "Well you already paid your deposit, so it's too late. Guess you will just have to go." I didn't know how to respond. I said, “OK” and walked away. Looking back, I now know Rita was the push that I needed. She believed in me, but most importantly God believed in me and knew what I needed. We left for Mexico on July 19th and I didn't know Rita well at all, but we soon became great friends. She was such an encouragement to me when I would get nervous or wonder what the heck I had gotten myself into. It was hard and painful and emotionally draining being there, but the difference was I was crying about the things I was seeing and experiencing. It wasn't about me and my pain, I was thinking about something other than myself. At the end of the week, I was so thankful for the experience and through God's grace and mercy, I not only made it through the week in Cancun, but my daughter and I ended up going the very next week to Monterrey because of some spots on that trip opening up at the last minute. When I got home, I realized I had been able to do something I thought was impossible. I spent two weeks way out of my comfort zone and I had done it without medication. My heart was beginning to heal. I came back with such an appreciation for all the things God had given me, instead of what had been taken away. This summer I served in India and went back to serve another week in Cancun. I know there will always be challenges and struggles, but I feel I am finally going in the right direction. Now, when I sing Trust and Obey, I know I have to trust God’s plan for my life. I must continually trust God’s plan is what's best for me. It won't always be easy and being a follower of Jesus doesn't mean I am problem free. I have made so much progress over the last year, but I still struggle. The difference now is I am learning to turn to Him when I have my hard days. With God's help I have learned to deal with things for the most part without any medication. I would trade all the hard times for the life I have now, because I know it's my story; it's how things are supposed to be and I'm ok with it. Oftentimes, we don’t feel ready for the big things in life, like getting married, having children, or even starting a house church, but we don’t need to be -- God is ready and with us. When Jillian Vincent was a freshman in high school she went on a missions trip to Tijuana, Mexico. When she returned from Tijuana, though, the Lord truly opened Jillian’s eyes. When Jillian met her husband, Tim, she realized they shared the same heart – they both felt a calling to be missionaries, but not the sort of missionaries that lived in exotic locations. They had both grown up in the suburbs, had a wonderfully safe childhood, and now felt called to be a light in areas close to home, places where children hadn’t had the same blessing of growing up within similar parameters and conditions. It was around that time they found the original Triangle House Church. They found that, suddenly, they weren’t “weird” anymore; they had found a company of “weirdos” who had already moved in and were loving the community right where they were, in the Dayton View Triangle Neighborhood on the West Side. Jillian compares the Triangle neighborhood to the Kingdom of God. For two years, Jillian and Tim worked alongside other members of the house church to love on and be in community within the Triangle, but they began to lose leaders. Tim and Jillian found that, in the midst of military moves, pursuit of other callings, and various trials, there were fewer and fewer people to do ministry with. After much prayer, they left the house church and joined another Region 1 house church. Jillian and Tim enjoyed being in community with their new house church but never lost sight of their desire to love on those in the West Side of Dayton. 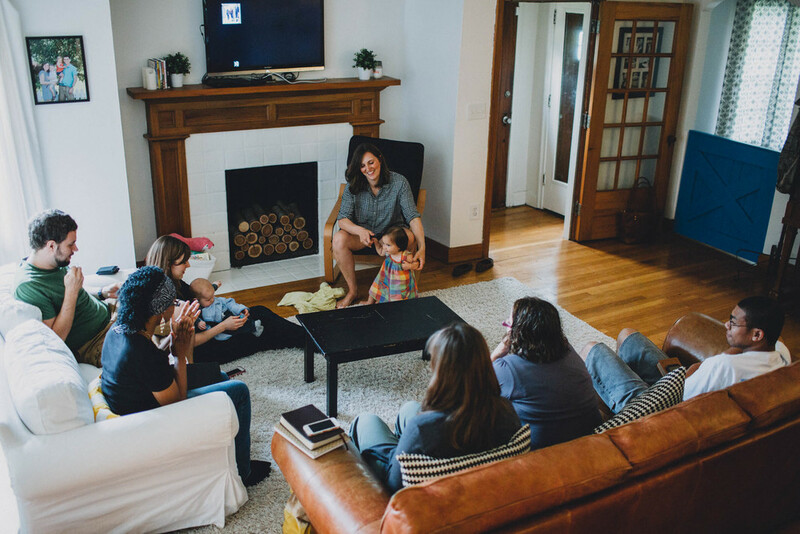 After a couple years with this house church, Jillian and Tim couldn’t believe it when their friends in ministry, the Herrs, returned to Dayton. Jillian and Tim had never lost hope for the Triangle community, and now, with the help of their friends, were ready to rebuild the community within their neighborhood. Shortly after Easter, Triangle House Church met again for the first time. Two of the men in their community run Saving Grace Ministries, a local ministry that reaches out to males in the Montgomery County jail system and seeks to help them find godly community once they are out of jail. They have a woman who grew up in the Triangle community that writes books about Biblical Womanhood. The Triangle House Church tries to love their neighbors with intention, planning one neighborhood outreach a season. They are also seeking to have “open schedules” to see when God is wanting them to say yes – from baking cookies for their neighbors to offering to help someone fix his or her car. Jesus came to seek and save the lost. Triangle House Church just wants to be where He already is.